I Took Risks. You Can Too! I faintly remember my childhood, and how I was as a little girl. I used to boss around, and was a true performer. I never feared going to the stage as I knew I was a born performer. I have always been a brave girl, who never gave up the idea that with hard work, will, and dedication, I can achieve anything in life. It does not mean that I never experienced failure. We are girls, and as we belong to the female species, everyone tells us to be submissive and scared of the society. 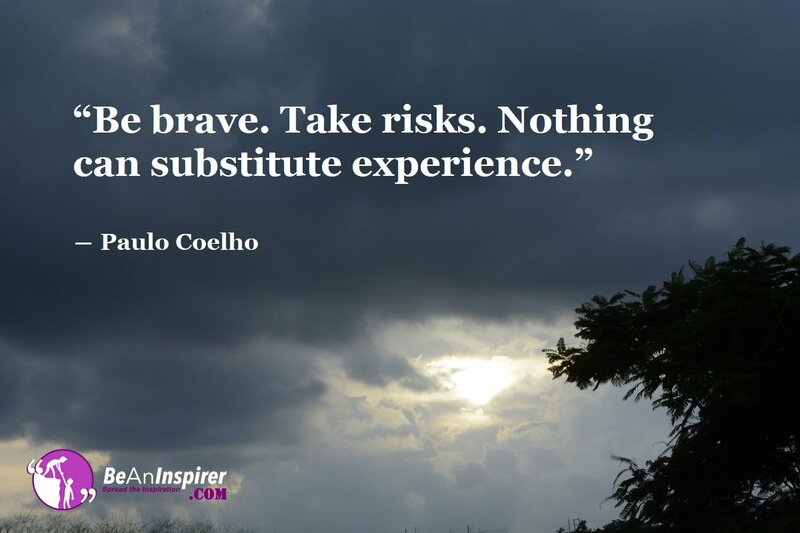 According to me, one has to be brave and take risks in life. My philosophy was simple that if I never take risks, I would never know whether I had chances of succeeding or not. Are you too scared to go for a solo travel? Do you get fearful about the future? Ah! We love sitting in front of the television and cursing the whole world. It is easy to sit at home and criticize everyone. It so happens that we get too scared about the outcome that we fear trying new things. Nobody likes to take risks and getting out of their comfort zones. Can I call you my friend? It is because you will trust my words once you accept me as your friend. You cannot change the world by criticizing others. You say that women are getting raped and the society should change. At the same time, you are too scared of going out because you think it is not a safe world. Now the problem with this is that you are not becoming the change. Are you? If you want to change the world, you have to bring about change on a personal level. Stop fearing, and join your dream which requires you to travel more often. I took the risk and went for a solo travel. My mother told me that I should be scared. Scared of what? I can tell you this much that more than being scary; it was a life-changing experience. I watched the crashing waves and the solitude felt amazing. I felt I belonged to the sky, the ocean, and the Sun. What if I listened to my mother and never went for the solo travel? I would never get to experience such bliss! We are too afraid to get into a relationship because we think we will end up getting hurt. What if we give it a chance and take risks? We are human beings and we believe that giving our heart would be a sin! I have seen people, who give up on their companion because they are too fearful that they would never get married to them. Why not give it a chance? What if it does work out? You wouldn’t want to spend your life with a person, whom you are not compatible with. If we shift focus from relationships to career, you would find that people settle for ‘safe’ jobs because they are too afraid to take risks and do what they love! I can just say that a real man smiles in trouble. When you have a strong will power, nobody will ever be able to shake you or defeat you. Just hang in there and let life surprise you. You need patience and taking risks is very important.